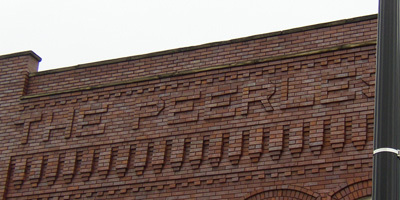 Building names spelled out in brick are a common feature of Columbus rowhouses. 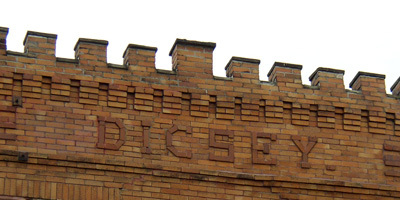 Featured here are Dicsey at 193-99 E. 12th Ave., Zane at 14-24 W. Ninth Ave., The Peerless at Chittenden and High, and the Cadillac at 303-17 E. 20th Ave. Rows of houses sharing walls with the units on either side go way back. Terraced houses, as they are called in England, were built as far back as the 18th Century. The famed Royal Crescent in Bath is one upscale example. In Europe, rowhouses comprise whole sections of many cities. In the United States, rowhouses are a prominent feature in may cities. New York City has its famous brownstones. Philadelphia, Baltimore, and Washington DC, are largely rowhouse cities. Baltimore in particular is defined by its rowhouse neighborhoods. Further west, rowhouses also figure prominently in the urban landscapes of Chicago, Cincinnati, and St Louis. Each city’s rowhouses have their unique local style and features. 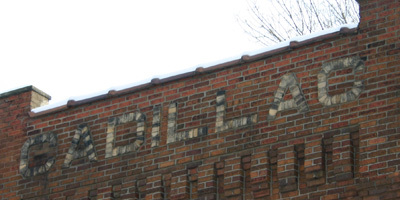 Rowhouses in Columbus were mostly built from the early 1910s through the late 1920s. Rowhouses in the University District were heavily constructed in the years just after the First World War. Between 1900 and 1920, the population of Columbus almost doubled. All those new citizens needed someplace to live. Rowhouses struck a compromise between attractive, appealing housing with greenspace and efficient use of real estate. Brick rowhouses became common in the city’s new streetcar suburbs. 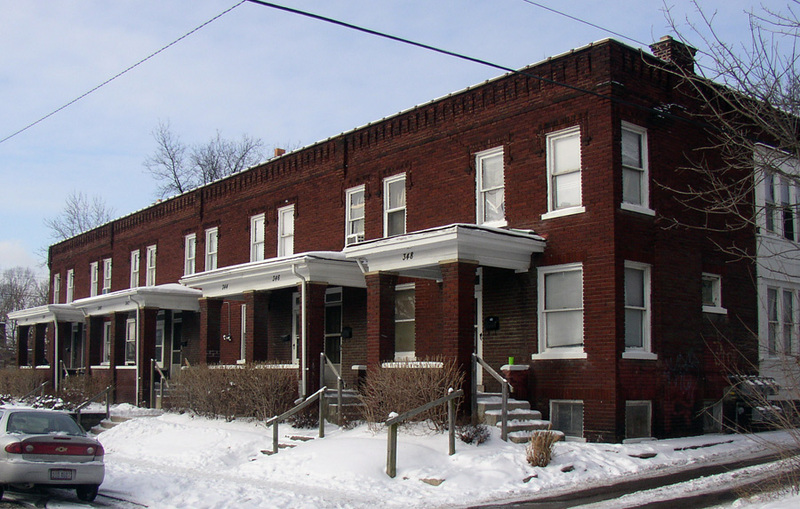 Rowhouses are a major part of the urban landscape not just in the University District but also Victorian Village, Harrison West, the Short North, South Linden, Grandview Heights, and Franklinton. The section of Weinland Park along N. 4th between E. 5th Ave. and E. 11th has one of the densest concentrations of rowhouses in the city. Another large concentration lies in the Fifth by Northwest neighborhood across the river. Rowhouses become rarer farther out from the central city. The seven unit structure at 336-48 E. 14th Ave. is a very representative Columbus rowhouse. 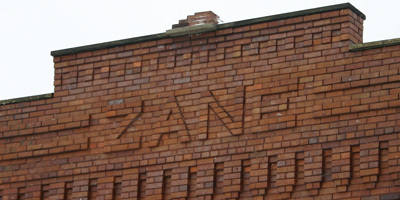 Built in 1917.